A food state vitamin C supplement derived from some of nature’s richest sources of this essential vitamin and antioxidant: Acerola cherries, rosehips, blackcurrants, parsley leaf and elderberries. The natural food ingredients are more easily recognised by the body, facilitating maximum digestion, absorption and utilisation. The vitamin C is retained for longer; not rapidly excreted from the body. Packed with antioxidants, vitamins, minerals, bioflavonoids, pectins, essential oils, lycopene, carotenoids, plant sterols, catechins, polyphenolics and many other phytonutrients, this vitamin C supplement is gentle and non-acidic. 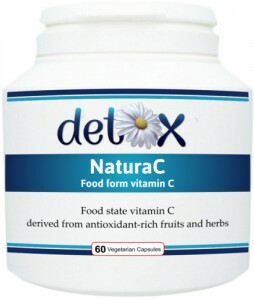 No artificial vitamin C (ascorbic acid). 1 - 3 capsules per day with or without food or as advised by a health practitioner.